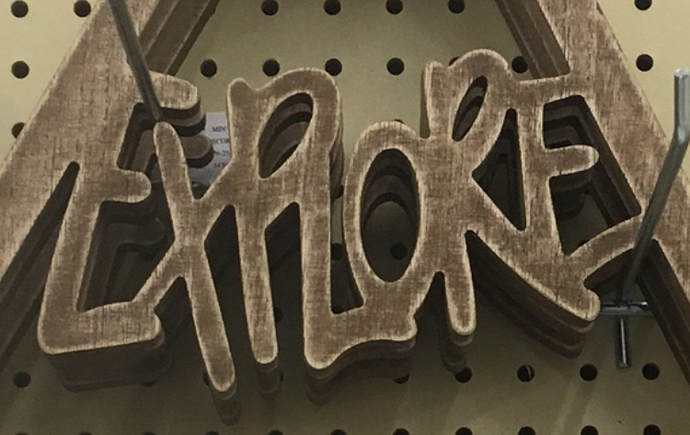 What is the best way to do connected letters/1 peice words? My wife wants me to make this and I know I can do it but will likely make it much harder than it has to be! Also any ideas on what font this is? Oh yeah I have Aspire - is this an option? At work thinking about this and don’t have my laptop. You could draw it out on paper, take a picture, bring it in to inkscape to create an svg, then use the svg in create. Or just overlay the letters in inkscape, manually. I think you can do this, I’m still not well versed in inkscape. Not really sure on the font. If you have a font that you like, you can use the text tool in Aspire to create each letter as a separate vector. Stretch/Skew/Rotate as desired and move each letter into position. Finally, use the scissors tool to cut the vector segments that are inside your overlapping areas; be sure the “connect vectors” option (or whatever its called) is checked in the scissors tool. That looks great Stephen!! Thank you!! This forum is awesome - Thank you all for the help!! It supposedly will supply the font name OR give you the closest font to whatever is shown. Also with Aspire you can take a picture, import it, trace it, scale the vectors to a certain size, then “profile tool path”, the vectors.